Wind power is currently the fastest growing renewable energy source (in terms of capacity - solar has a faster percentage growth rate), and looks like remaining so into the next decade. While most attention is focussed on the mainstream approach of generating power using large wind turbines - both onshore and, as Jerome recently looked at, offshore - there are a wide range of alternatives being considered for harvesting energy from the winds. In this post I'll look at 2 approaches that have received some attention in the press recently - attaching kite sails to ships and airborne wind turbines. Shipping is the most energy efficient way of transporting goods around, and it therefore likely to be increasingly important for trade as the availability of fossil fuels decreases and the cost of these increases. According to the Financial Times, it often now costs more to ship a container by road 100km from a port to its final destination than it does to move the container by sea from China to Europe. One way of increasing the energy efficiency of shipping is to increase the size of the vessel, which big shipping operators like Maersk are already pursuing. Another way to reduce fuel consumption for shipping is being promoted by German company SkySails - attaching a kite the size of a football field to a vessel and using wind power to help save fuel costs. The SkySails apparatus consists of a towing kite with rope, a launch and recovery system and an automatic control system. Autopilot software monitors data from the sail and makes adjustments to ensure the sail is set at its optimal position. The company also offers a weather-based routing system to help ships sail in optimal wind conditions. The kites usually fly around 1000 feet above sea level where winds can be up to 50% stronger than at deck level. The first ship using the system, the Beluga Skysail, is expected to set off from Germany this month (The Guardian says it is bound for Venezuela while The Times says it will, fittingly, be hauling windmills from Esbjerg, Denmark to Houston, Texas). Once it is well clear of the land, it will launch a 160 sq metre kite, which wind tunnel tests and sea trials suggest will tug it along and save 10-15% of the oil it would normally burn. In time it will be fitted with a larger kite, possibly saving 30-35% on fuel. One estimate predicts this could save around US$10 million over the lifetime of a vessel. The Guardian quotes Christine Bornkessel from the Beluga shipping line, which has 52 merchant vessels, as saying "This is a serious attempt to reduce bunker [fuel] costs and polluting emissions. The kite will be used whenever it is possible on the voyage, and we are convinced it will revolutionise cargo shipping. We would consider fitting them to all our ships". The SkySails company has ambitions to roll out the kites quite rapidly - “About 1100 of the 1900 newly built vessels joining the world’s merchant fleet each year are destined to be outfitted with SkySails propulsion”. If the Beluga performs well on wind power and if the high-flying kites dramatically cut its fuel consumption, then the age of sail will be back. Orders are already coming in, ranging from trawlers to a super-yacht. If he realises his dream of re-equipping the world fleet, Mr Wrage calculates that his sails could save 142 million tonnes of CO2 a year, equivalent to about 15 per cent of Germany’s total emissions. The 35-year-old engineer, who came up with the idea as a teenager when he found himself being dragged by a kite along a blustery North Sea beach, is not the only person brooding about how exactly to reduce the gases released by the world’s shipping fleets. The problem is huge. Merchant ships, which carry 90 per cent of the world’s merchandise, produce more sulphur dioxide than all the cars and lorries on the planet. And, according to the International Council on Clean Transportation, they also generate about 27 per cent of the world’s nitrogen oxide emissions. Wallenius Wilhelmsen Logistics, the Norwegian fleet management company, has designed a green flagship, the Orcelle, which will use rigid, rotating sails to capture the strongest winds. When the wind drops the sails can be used as solar panels. But the company admits that it could take 15 years before the ship is developed. The sails, made of an ultralight synthetic fibre, are shot up as much as 300m (984ft) into the sky. ... Mr Wrage calculates that most ship owners should be able to recoup their £290,000 investment in the kite sails within three years. Drawbacks associated with this scheme include the additional costs associated with the kites - both with buying, installing and maintaining them, and with training and rostering crew members to tend them. Skysail isn't the only company investigating the kite sail idea - US company KiteShip is building large kites, mostly for yachts, and plans to expand into the larger cargo and cruise ship markets. 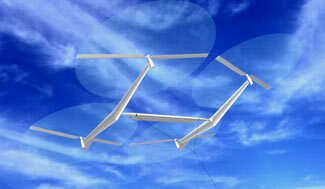 Airborne wind turbines are an idea that I've always found myself somewhat bemused by - "surely they can't be serious ?" I think to myself, whenever I come across another tale of a company trying to fly kites with wind turbines attached to them. These sorts of stories have continued to appear with monotonous regularity however, and not just out on the alternative energy fringes - in recent months I've seen articles in places like The New York Times, The Economist, PBS' I, Cringely, The Energy Blog, TreeHugger and WorldChanging - many prompted by Google.org's investment in airborne wind company Makani Power (part of their program to make "Renewable Energy Cheaper Than Coal"). The driver for these schemes is that the intermittency issue which reduces the effectiveness of wind turbines operating at ground level is asserted to be much less of a problem at 1000 feet, where the winds tend to blow steadily. Proponents of airborne wind power like Ken Caldeira at the Carnegie Institution's department of global ecology at Stanford University say that if we could tap into 1 percent of the energy in high-altitude winds it would be sufficient to provide all our power needs. The company that has garnered the most attention in this field is Ottawa-based Magenn Power. Magenn's system is a lighter-than-air wind turbine capable of powering a rural village - the 30 metre wide, helium-filled "Air Rotor System" contains a turbine that spins around a horizontal axis and can produce 10 kilowatts of energy as it floats above the ground while attached to a copper tether. Larger models — ones that might power a skyscraper — are also reportedly in the works. The company claims the governments of India and Pakistan have expressed interest in the first version. Magenn is planning to launch a 1kw prototype (costing around C$1 million) into the air above Ottawa this (northern) spring. The entrepreneur behind Makani Power is Saul Griffith, originally from my hometown of Sydney but now based in San Francisco. This company is the least transparent of the airborne wind power companies, with very little known about what they are up to. Sky WindPower is proposing [to] use clusters of Flying Electric Generators (FEGs), on the end of a current carrying tether, in the jet stream at 15,000 to 30,000 feet. The company has done wind tunnel tests and low altitude tests to prove their idea. They are hoping to build a 200 kw model, flying at 15,000 ft, somewhere in a remote area of the U.S. They envision a commercial FEG will have four or eight rotors each generating 2.5 MW. Clusters of FEG's could provide as much power as need for a given site. The FEG would fly up into the sky, with its rotors powered by electricity off the grid, pulling up its tether. 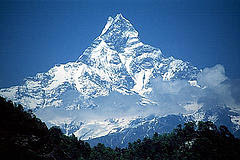 Once it at its desired altitude it would change the pitch on its rotors and start generating power from the wind. GPS technology would be used to assure that the rotorcraft stays within a few feet both horizontally and vertically of where it is programed to be and a computer would control the rotorcraft's attitude, i.e. pitch, roll and yaw. The amount of power that you can produce in a wind turbine varies as the cube of the velocity and linearly as the density. So although the density decreases with an increase in altitude, the increase in velocity that you gain with higher altitudes more than makes up for the decrease in density. This further explains the advantage that FEG's have flying at high altitudes and allows the rotors to be smaller in diameter. The wind speed, in addition to being higher, is more uniform. It is much more steady, blowing at high, useful velocities a much greater percent of the time than do winds at ground level. This gives FEGs the advantage of having a higher capacity factor. Capacity factor is the percentage of energy actually captured relative to what would be captured if the wind turbines were operating at full capacity all the time. Ground based sites that can produce a capacity factor of 35% are hard to find. Capacity factors in the jet stream range from about 70% in the southern parts of the U.S to over 90% in the north. At a capacity factor of 90%, FEGs could become the nation's cheapest source of electricity, with an estimated cost per kilowatt hour of less than 2 cents, about half the price of coal. Also the wind tends to blow from one direction and when it changes direction it changes slowly. The air is free from turbulence caused by friction and ground protuberances, but is subject to high altitude turbulence. This is moderated by the ability of the FEG to sway on its tether rather than being attached to a ridged tower. The FEG can move up and down on its tether the same way an airplane does to avoid turbulence. The use of tethers to position objects in the sky is not unknown. Balloons tethered at altitudes up to 15,000 feet exist now at fifteen sites along the southern borders of the United States carrying radar equipment to detect illegal flights from the south trying to smuggle drugs. These sites are shown on all aeronautical charts, as restricted spaces, and are well known to pilots. By reserving less than one four hundredth (0.4%) of U.S. air space, located at relatively remote locations, not on airway routes, all the nations electrical energy needs could be met. The strength to weight ratio of new tether materials has improved over time so much that tethers now available are no longer too heavy to be held up by flying energy generating devices at the needed high altitudes. Tether technology is not simple, but a number of vendors now compete in this field selling primarily to the military and NASA. The FEG would be able to moved up or down on its tether to seek the best wind conditions or to move out of excessively turbulent air space. WorldChanging has some more details on SkyWindPower, noting some of the main drawbacks with these schemes. Output would also be less dependent on location than it is on the ground, simply because terrain doesn't matter much when you're at 35,000ft; however, since the jetstream and other "geostrophic" winds don't blow much at latitudes near the equator, it would be useful primarily for middle- and higher-latitudes. They can't promise uninterrupted power all the time, however. In an electrical storm, the power-carrying tether becomes the biggest lightning rod you've ever seen. (Move over, Ben Franklin!) Their website says this problem is "frequently brought to our attention, and must be addressed." Their plan is to take the flyers down to land before a storm gets bad, and wait for it to end. The flying windmills would initially get in position under their own power, using their motors to drive the propeller blades and helicopter upwards until they reached altitude. Then the motors would turn off and become generators as wind pushes the propeller blades, and the whirligig would float instead of fall because when tethered, the lift generated by the wind would overcome the craft's weight as it also generates power. The obvious question is safety. What happens if one of these things falls out of the sky? The proposed design has quadruple-redundancy in the propellers used to hold it up and generate power, and the units could be located away from population centers, so that seems reasonable. What about planes running into them, or more likely, their tethers? They would fly in restricted airspace. Sky Windpower points out that there are already many high-altitude tethered balloons in the US that have not had problems, and that enough installations to generate 100% of the US's power needs could fit in 1/400th of the nation's airspace. What about birds getting killed? They say that the flying windmills could make noise that would keep birds away; this would be prohibitive for ground-based turbines, but at high altitude no people will be around to be annoyed by it. The prototypes Roberts has been making for the last 25 years have gone from wind tunnel to field trial, and they apparently work, with no new technologies required. However, they have been stalled seeking funding for the last three years. The text on their website shows a woeful lack of marketing savvy, leaning towards crackpottyness, so they may not be getting funding anytime soon. But hopefully they will find someone willing to give them a shot, since they seem the most promising of the three [companies looked at here]. Robert Cringely of "I, Cringely" explains some of the history behind these schemes in "Oh, and We Also Saved the World: Google's Energy Plan". What's cool about these tethered tensile wings, he explained, is that they can be designed in such a way that no aircraft fuselage is needed and yet they can lift (vertically, straight from the ground, no runway even required!) enormous weights. And I mean ENORMOUS weights, like a thousand tons. A fully loaded Boeing 747-400 weighs about 400 tons, so a THOUSAND tons would change the nature of airfreight. But there's an even better application for this technology than airfreight, he explained, electric power generation. Build a gigantic tethered tension wing and power it with electric motors mounted in the leading edge of the wing. Send the electricity to run these motors up the tether, itself. The wing will take off vertically and once it is at the end of its rope, so to speak, can be made to circle thousands, or even tens of thousands, of feet off the ground without a pilot or any sort of crew. Remember from your ground school days that wind tends to increase with altitude. Once aloft, circling in the stiff breeze a few thousand feet in the air, it should be possible during most daylight hours to just turn off the electric motors and get them running as generators, taking energy out of the wind. This would be regenerative air braking. The problem with wind power is that much of the time there isn't enough of it available to even justify energizing the alternators attached to the large windmills used in wind farms. Unless the wind speed is over, say, 10 miles per hour, it isn't worth running the windmills at all. And above some speed on the order of 40 mph, it again isn't worth the effort, this time because of fear that high winds will damage the windmills — windmills sometimes costing hundreds of thousands of dollars each. But power-generating tension kites are different, as Lynn so ably explained: "the numbers strongly infer that such a wind turbine system can produce power for around a fifth to a tenth the cost of current generation systems, depending on site costs. This is roughly US 0.5 cents a kilowatt hour, with the likelihood that this will reduce further with mass production." Five tenths of a cent per kilowatt-hour is VASTLY cheaper than the average retail price was for electricity anywhere in the U.S. in 2005, where electricity costs ran as high as 12 cents per kilowatt-hour in California and 14 cents per kilowatt-hour in the state of New York. So even though the kits would have to be all new construction and the old coal, gas, and oil-fired power plants mothballed or dismantled, the payback period for doing so would be measured in months, not years or decades as most such capital expenses are today. Today, with energy costs even higher, the payback would be even quicker. Getting the cost of wind-power production so low depends on a couple of factors — building kites that cost very little for the power they generate and allowing them to harvest energy from a larger slug of airspace than is used by the big ground-based windmills employed in most wind farms. "The trick is that the propeller is operating at the speed of the airplane, which is many times greater than that of the true wind speed," wrote Lynn. "At an overall lift to drag ratio of ten the air plane speed is ten times that of the true wind, with power proportional to wind speed cubed, the propeller can have a thousandth the swept area of a comparable wind turbine for the same power. This makes for a very compact and effective unit, it is important to exploit this apparent wind directly as it allows for much higher specific speed of the propeller and generating unit, (no gearing)... Line length can actually scale with size, somewhat, a 100MW unit might optimally have around a 1000m line. " Such wind kites would be cheaper to build than current windmills because their structural efficiency is so high, according to Lynn. In fact the weight of such a kite turbine might be only one percent that of a comparable windmill. Pete Lynn no longer works in New Zealand. Today he works in Emeryville, CA at a company called Makani Power, which is developing exactly the sort of power-generating kites Lynn envisioned six years ago. Go to the people section of Makani's website and you'll see the healthiest bunch of windsurfer/engineers imaginable, including Pete Lynn, who actually seems to play a minor role in the company. Wubbo Ockels of the Delft University of Technology in the Netherlands has been developing another approach to airborne wind generation at lower altitude, with backing from Royal Dutch Shell and Nederlandse Gasunie, a natural-gas company. Dr Ockels’s idea is that a kite (without rotor blades) be launched from a ground station, turning a generator as it rises to an altitude of several hundred metres. When it reaches its full height, it alters its shape to catch less wind, and can thus be reeled back in using much less power than it produced when it was being paid out. Imagine the future possibilities! We could even put up vertical sticks off the deck of the ship (dunno, call them "masts") and attach the sails directly to them. The world really is progressing fast. The cost of the Skysail seems cheap to me, at $250,000 or so, when you consider that cape size dry bulk shippers were being leased for around $125,000 a day about a year ago. Said to deliver up to 6,800hp. I am curious if anyone has considered putting large(1.5MW) turbines on a ship. 5 of them would fit on the surface of a 200M purpose built container ship and provide about 10K HP. It wouldn't be the fastest ship around, but would be one of the cheapest ones to run. Covering the containers with a removable solar panel would add to the power significantly. Again, not fast, but certainly cheap. As a point of reference, the old Liberty freighters of WWII vintage were 400-450'long and had 2,500 HP power plants and would go 11 knots. Really very informative about the SkySails and KiteShips wind turbine Wind Turbine..